The market pulled back sharply today booking its worst performance since the first trading day of the calendar year following the weak lead from overseas on Friday night, growth concerns in a number of regions coming back into focus and overshadowing expectations of lower interest rates for longer. Talk around the desk today focussed on the strong rise in the market despite no real earnings growth – typical of analysts to highlight a negative influence on a down day! P/E expansion thanks to lower interest rates can only last for so long and the market, being the fickle beast that it often is may just start to focus on that ‘risk factor’ and sell stocks lower. Those sectors that have been hottest recently felt the brunt of today’s selling, the IT stocks the main casualty with the likes of Appen (APX) down -5.63%, Afterpay (APT) off -5.33% while Altium (ALU) dropped -8.40% even Xero (XRO) fell by -3.44%. When hot money leaves hot sectors it can do so with some force. 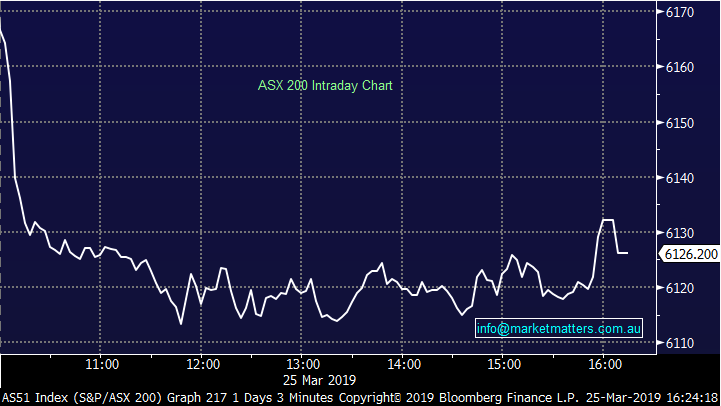 Then again, they did better than poor old McGrath (MEA) who snuck through an earnings downgrade just before 5pm on Friday afternoon – surely not a good look from an organisation that we (although fewer of us lately) trust to sell our biggest asset – Harry covers in more depth below. 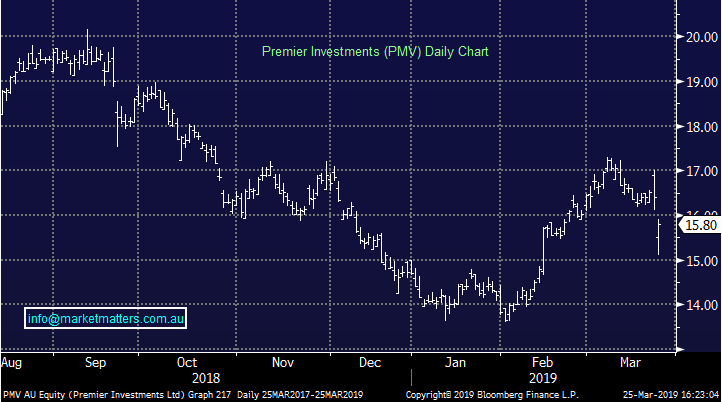 Looking around the grounds today it was actually interesting to see banks bid up from their early lows, ditto for some of the large cap miners like BHP, RIO and FMG while the defensive Real-Estate and Utility stocks did okay as did the Gold stocks. As we suggested this morning, $10bn worth of dividends are set to hit investors' back pockets this week alone. This is a major contributor to March / Aprils usual strength in the local market with the average gain during this period over the last 10-years greater than 3%. US Futures were trading lower though out our time zone - down around 0.50% even through Donald Trump has escaped any criminal charges from Mueller's probe into the President. Here’s was Mr Trump had to say… "After a long look, after a long investigation, after so many people have been so badly hurt, after not looking at the other side, where a lot of bad things happened, a lot of horrible things happened, a lot of very bad things happened for our country, it was just announced there was no collusion with Russia." Not a lot of stock specific news out today of note however there was some big moves at the stock level flowing on from news last week. Premier Investments (PMV) – 3.66%, down as the market becomes increasingly concerned about their overseas growth prospects through Smiggle. Citi for instance estimated that 1H19 sales fell by 2% in Australia and 7% in the UK, with bricks and mortar LFL sales falling by 6% in Australia and double digits in the UK. It seems Smiggle are now targeting wholesale and online channel expansion which does suggest that they’re struggling through their normal outlets. While Smiggle has been a big driver of growth in periods gone by, this result saw the other more traditional brands do better. Ultimately, last week’s result was a good one in a tough environment however it may take the market some time to digest the changing strategy in Smiggle. McGrath Ltd (MEA) -7.69%, Ouch!!! tumbled to record lows again this morning, while setting a record low close this afternoon since listing at $2.10 back in late 2015. The stock has never traded higher than the offer price, being stuck in a downtrend since it debuted on the ASX. Today’s hit follows a trading update the company tried to sneak past the market, posting it near 5pm on a Friday afternoon. The note to the market detailed the impact that falling house prices are continuing to have on the stock – the same reason it blamed for the loss of $2.5m at the underlying EBITDA line when they posted half year results in February. 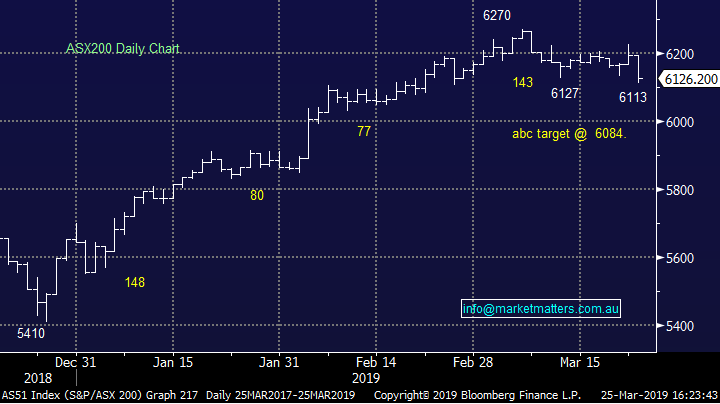 That EBITDA loss almost doubled in the first 2 months of this year, with the company saying that as at 28 February it had generated -$4.5m EBITDA for the eight months to Feb 28. 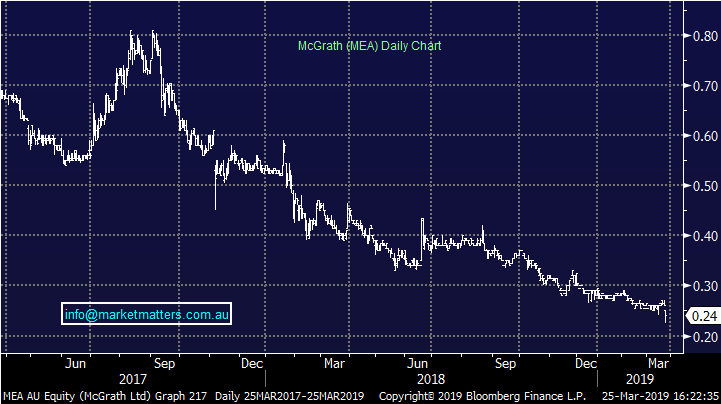 So with 4 months left, the trend shows no signs of turning for McGrath – seasonally this half is weaker than the first and a federal election still to come will subdue volumes for the rest of the year. At this rate, MEA should post a full year EBITDA loss of over $6m. The company is now languishing with a market cap of just $43m. Down from around ~$350m at listing.